The 4th National Climate Assessment (NCA) was released Friday, November 23rd and was promptly greeted by wide media coverage and wringing of hands over its dire predictions for the planet’s future. Like the previous three assessments, it was mandated by the Global Change Research Act (GCRA) of 1990. Like the previous iterations, it relies heavily on failed climate models to speculate about calamitous events many decades into the future. 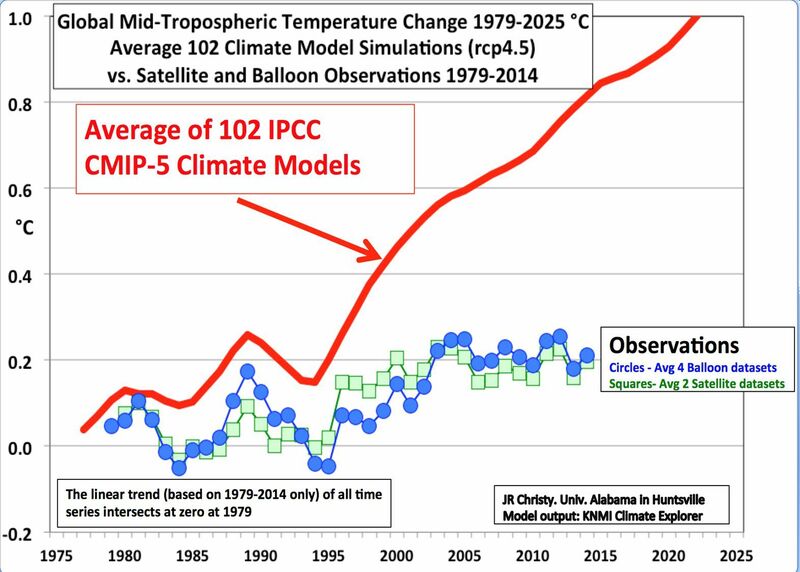 It is well documented that climate models used by the Intergovernmental Panel on Climate Change (IPCC) on which this report relied, over-predict warming by 2.5 to 3 times. That the recent report would rely on these models is not surprising, but this 1,600-page alarmist manifesto bases much of its speculation on the most extreme of the failed projections. The predictions are based on what is known as a Representative Concentration Pathway (RCP) of which four were included in the latest IPCC report. The one relied upon by this new report is the most extreme of the four RCPs and hence predicts the most warming by 2100. Rather than detail the numerous cases of cherry-picking and flaws within the new report, it would be enlightening to examine the one predicted climate catastrophe that was prominently highlighted by the NCA report . It is curious that the authors chose to select a predicted linkage between man-made warming and an increase in forest fires to be the poster-child for this report and the fear that they are hoping to engender. While raging infernos supposedly fueled by climate change are likely to get peoples’ attention — particularly given recent horrific events — it is also probably the most easily debunked of all the apocalyptic scenarios presented. The science, facts and data from government agencies and peer-reviewed papers strongly contradict the claim of increasing fires. In fact, the evidence is startlingly at odds to the narrative presented in the report. National Interagency Fire Center (NIFC) data going back to 1928 reveal that the number of fires in the United States and the area burned have been in a significant and long-term decline, both exhibiting a more than 75% reduction, while CO2 has been inexorably increasing. Within the United States, even the data on the number of fires in California, show that the number of fires has been in a 30-year decline in the Golden State and is now half of that in 1987. Several large studies of the incidence of fire globally and in the northern hemisphere do not support the alarmist case linking fire to man-made warming. A study by scientists with the Canadian Forest Service compared temperatures and CO2 concentration versus frequency of forest fires over the last 150 years in North America and northern Europe and catalogued a significant decline reaching back to 1850. Backstopping that were two recent studies (here and here) of global fire that both categorically confirm that global fire has been in a long-term decline. Nearly all these fire experts agree that increased soil moisture due to climate change is the causative agent! Warming temperatures lead to more water vapor and precipitation and increasing CO2 leads to less water use by plants. If the featured climate calamity of this recent government report is so easily disproved by the top experts in the field, why should we not question everything else coming from this group? Rest easy: You can turn up the heat on these cold nights without fear of destroying the planet. Gregory Wrightstone is a geologist with more than 35 years of experience researching and studying various aspects of the Earth's processes.